Select one of Our Packages and make a booking online. Book your Miracle Beginnings experience today! Welcome to Miracle Beginnings 3D 4D Ultrasound. We are located in the Redlands on Brisbane’s Bayside. Miracle Beginnings is exceptionally passionate about giving expectant parents the very best personal bonding experience in our boutique home studio. We specialise in non-diagnostic ultrasounds. We allow you to see your baby as early as 10 weeks as a reassurance scan and do gender determination from 15 weeks. We take the time to ensure accuracy and customer satisfaction with our personal service. We use the most up to date technology available, which allows you to see your baby in 3D, 4D and high definition 5D, otherwise known as fetal realistic view. We look forward to meeting you and being apart of your pregnancy journey! We don’t do dating, nuchal or morphology ultrasounds. See your baby in the most realistic, true to life view possible. Gender determination from 15 weeks with images. Affordable packages for each stage of your pregnancy. Gender Reveal confetti balloons, powder and confetti cannons available for purchase, record the sound of your baby’s heartbeat to our plush animals, gift vouchers & more. Miracle Beginnings are the first to offer our clients this exceptional technology at no extra charge. Hello Mom is a smartphone app (Android and iOS) made specially for pregnant mothers. 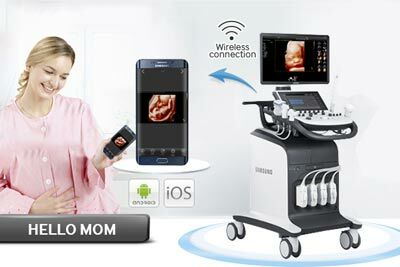 It allows wireless downloads of still images taken during your Miracle Beginnings ultrasound session directly to your mobile phone. This amazing app makes it easy to view, share and cherish your precious ultrasound moments! Take a look at our packages to see our price structure and available options. The ideal time to get facial images of your baby is between 28 & 32 weeks dependent on the position of your placenta. We determine baby’s gender from 15 weeks through to 19 weeks. If baby does not co-operate and open their little legs, you will be asked to return for a follow up scan free of charge. Increase your fluid intake at least 5 days before your ultrasound to ensure good clarity and volume of amniotic fluid! Have something sweet like orange juice or something with natural sugars at least half an hour before your ultrasound so that your baby is active. Mum’s body fat content and any loose skin which can create a fuzzy image due to a weakening of the ultrasound wave. The position of the placenta (anterior – meaning over the top of baby and posterior -meaning under baby). Other factors also include baby’s position on the day of your ultrasound such as Breech presentation, Transverse lie, baby’s spine facing up to Mum’s belly or hands and umbilical cord in the way of the face. We will always do our best to encourage your baby to move, but if baby does not co-operate you will be asked to come back on another day free of charge to try again. Thanks Claire for being super patient with our stubborn baby. Claire made us feel relaxed and comfortable and was happy to take her time making sure we were happy with the images we received. Claire is welcoming and friendly & you can tell that she enjoys her job. Very informative and interactive during the scan. A nice space to relax while you get to say hello to your baby! and local to home which was very convenient to get to. I would recommend Claire if you would like to get keep sake pictures of your bub. I had my gender scan today. I cannot recommend this enough it was the most beautiful experience so precious thank you so much Claire. Claire makes you feel so comfortable and at home; the whole experience of her Miracle Beginnings is completely different to medical ultrasounds... it feels more like a pamper experience! You can tell how passionate she is about bringing you the gift of seeing your baby growing inside you. It really is a precious experience which offers comfort and bonding during your pregnancy. I would definitely recommend Claire at Miracle Beginnings. BEYOND AWESOME. Customer service at its best, Claire goes above and beyond to make a great experience. Highly Recommended. What an amazing experience! 5 Stars doesn’t seem enough. Just to say a little about Claire and her services, Claire was amazing, and provided a clean and professional service, with a very welcoming and comforting persona. My daughter and I were so taken by her compassion and love for what she does, trying her upmost to achieve the best pictures she went far and beyond. Would highly recommend Claire and her services to anyone. Thank you so much Claire. Such a professional service. Thank you so much Claire for going above and beyond, it was an amazing experience. Highly recommend Claire from Miracle Beginnings! My partner and I had the best experience finding out the gender of our last baby. We felt so relaxed and comfortable within Claire’s home studio. The images were super clear and I loved that Claire took her time for us to see our baby properly. The BEST place I've been for an ultrasound, Claire was absolutely brilliant and so professional throughout it all, my partner and I felt so comfortable and had our minds put at ease while you took time to show us every aspect of the baby that you could. Thank you so so so much.